I recently started chanting one more round every day – which brings me to a grand, glittering total of 3. Not so impressive considering I have been told about the benefits of chanting since my first day at the Bhaktivedanta Manor Nursery – some eighteen years ago now. I’ve had a funny relationship with chanting rounds over the years. 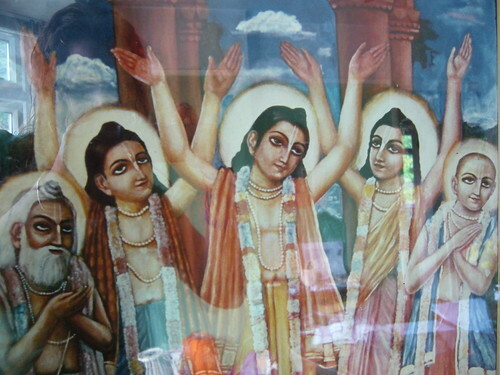 In school (Bhaktivedanta Manor Gurukula) we had to try and finish one round in the morning. We all normally did, but despite our teacher’s frequent reminders that what counted was ‘quality not quantity’, we would rush through the mantras, probably thinking about our imminent breakfast, or even better – breaktime! At home, I would wake up every morning to the sound of my parents chanting but I didn’t really see it as something I should do. Chanting rounds was for adults and wouldn’t do it unless made to. My parents never forced me to chant, but as I got older, and went to a normal secondary school, they did ask me to sometimes, probably hoping that a few obligatory rounds would awaken my natural desire to chant Krsna’s names in the morning. But it didn’t really work like that. Aged thirteen, if my parents asked me to do something, (even if I actually wouldn’t mind doing it) that instantly made me want to do the exact opposite. I didn’t want to do what they wanted me to do. The thought was mortifying. Needless to say, my bead bag remained untouched for a few years. Then somewhere, something began to change. I went through some difficult times in school, and I realised that if I wanted to pray to Krsna, this was the best way to do it. I still didn’t feel the need to chant regularly, but I was no longer embarrassed if I did. Gradually, gradually, my attitude took a turn. But I still felt frustrated. Now I wanted to chant at least one round a day, but with no one forcing me to and only my own weak desire to push me on, I started and stopped countless times. I would chant everyday for two weeks, only to miss a few days and give up. In 2005, I went with my family to India for the first time in ten years. At the Siddha Bakul tree in Jagannath Puri, where Haridas Thakur would chant 300,000 names of Krsna daily, I prayed to become attached to chanting. I prayed for his mercy, our ‘Namacharya’, who showed us all how to chant with devotion to Krsna through his extraordinary and exemplary life. So what happened next? Well, though we often hear amazing accounts by devotees, whose spiritual lives have taken an astonishing turn for the better, my story has no dramatic turning point. Two years on, and I’m still struggling to chant a few rounds. But I still feel blessed. Around me, I see those of my generation becoming enthused to chant Krsna’s names. This year my dearest friend Nadiya, who I’ve known since we were babies, took initiation and committed to chanting sixteen rounds daily. As the year progresses, other dear friends have taken the same step, or have increased their commitment to chanting and Krsna Consciousness in a significant way. I was thinking about this recently in my violin lesson, as my violin guru taught me a new composition – ‘Vinayaka Ninnu’ in Ragam Hamsadhwani. 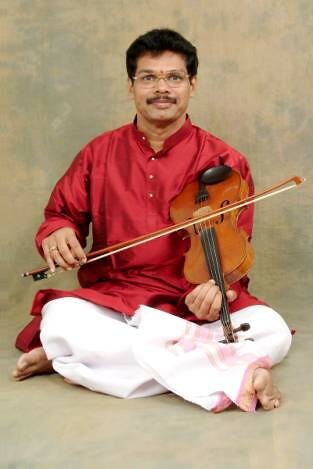 In Carnatic music there is a principle known as sangati (Sanskrit – ‘sam’ – together, ‘gati’ – movement). In practice, this principle is the traditional method of melodic development in a composition. The way it is normally applied, is that the simplest form of the melody will be played first; often several times. Next, a small variation will be made, an ornament on the main melody or a slight difference in notes. Each variation is called a sangati, and as the piece continues, each sangati builds on the previous one, becoming more and more complex, but still progressing in a very logical way. This steady and sequential progression is vital to drawing out the beauty of the melody. As I played the other day, I realised that whilst thinking about sangati I had been reminded of a vital principle of spiritual development. The evolution of the tune; the way it grows, each theme building on the previous one, whilst essentially retaining the basic melody, mirrors our spiritual journey in many ways. I think so often, spiritual endeavours can fall flat because we take on commitments that we are not ready to fulfil. This inevitably leads to discouragement and even sometimes a significant decrease in spiritual practice. In the story of the tortoise and the hare, the swift hare tried to cheat, taking short cuts to win the race, only to be beaten by the tortoise who advanced slowly and steadily. It seems to me that being honest about where we stand; striving to build a strong foundation, and first becoming steady in our basic practice, before moving ahead, will hopefully result in much greater success. In the Naradiya Purana it is directed, ‘One should not accept more than necessary if he is serious about discharging devotional service.’ The purport is that one should not neglect following the principles of devotional service, nor should one accept the rulings of devotional service which are more than what he can easily perform. For example, it may be said that one should chant the Hare Krsna mantra at least one hundred thousand times daily on his beads. But if this is not possible then one must minimize his chanting according to his own capacity. Generally, we recommend our disciples to chant at least sixteen rounds on their japa beads daily, and this should be completed. But if one is not even able to chant sixteen rounds, then he must make it up the next day. He must be sure to keep his vow. If he does not strictly follow this out, then he is sure to be negligent. That is offensive in the service of the Lord. If we encourage offenses, we shall not be able to make progress in devotional service. It is better if one fixes up a regulative principle according to his own ability and then follows that vow without fail. That will make him advanced in spiritual life. Whilst it takes humility to admit that we aren’t quite ready for the next step, humility doesn’t mean complacency. To maintain spiritual momentum we must always be striving for a higher goal. Of course, more often than not, we are not the greatest judge of what is best for us, which is why it’s so important to take the shelter and guidance of those who are. To accept such a spiritual master is the crucial point for advancement in spiritual life. One who is fortunate enough to come under the shelter of a bona fide spiritual master is sure to traverse the path of spiritual salvation without any doubt. Just as my violin teacher taught me each sangati in succession, only moving on to one of greater complexity when he was confident I could understand, and (shakily) play the current one, I pray now for the intelligence to recognise and receive this guidance in my spiritual life. I think often we want something earth shaking to happen – for the guiding hands of a spiritual master to come crashing into our lives and jump start us with an almighty lighting bolt of practical instruction. But if our eyes and ears are open we can see that we are being quietly guided all the time. I see the wonderful younger devotees around me, gradually increasing their commitment, and those who have been steadily doing so for decades, through the many inevitable trials and tests of faith. I see those in a similar position to me, slowly becoming attached to chanting the holy name and it gives me such encouragement. These people guide me by showing me that it is possible. I only hope that I can follow in their footsteps; playing the basic melody with conviction; and that at the right time I can take formally take shelter of a spiritual master who will guide me further. Sometimes I write little poems while I walk down the street, or when I’m stuck in traffic in the car…sometimes they’re haikus (5-7-5 syllables) and sometimes not. 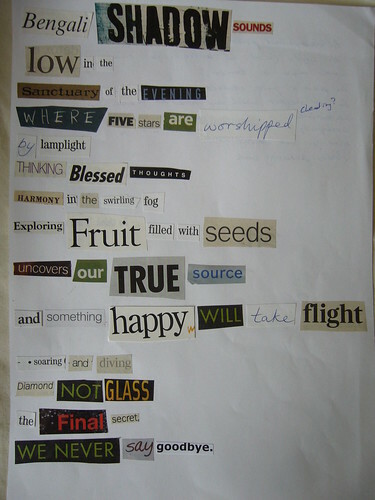 Recently for my creative writing class, we had to compose a piece of prose or poetry using ‘found words’. We were told to go through magazines, newspapers etc., cut out words that we liked, and try to make something of them. After two hours of painstaking cutting, I faced a good few square feet of floor, covered in little rectangles of paper. I struggled to find a starting point, arranging them and rearranging them to try and create something coherent. Suddenly, one word caught my eye – Bengali. Then another – sounds. I thought of kirtan and remembered the time when in Mayapur late one evening, as I walked back to my room, I passed some small buildings that were part of the bramhacari ashram. With the tour buses no longer honking their horns, the dogs no longer barking and the temple tannoy system fast asleep 🙂 , I could hear someone playing harmonium and singing, very softly through the trees. I stood for a few minutes. The floodlight above me was engulfed in a cloud of moths and mosquitoes but the sound was so captivating that I couldn’t leave. As I finally got into bed that night, I felt so thankful that their Lordships, Sri Pancatattva, had allowed me to come to this holy place, where Krsna’s name can be found everywhere at every time. I’m finally on my way to Vrindavan! This year during Kartik (October/November) I will be attending the first BBT Art Seminar. I am SO EXCITED! I had an interesting conversation this morning, with my grandma – who turned 74 today. She’s been visiting with my Auntie over the weekend, and I have found myself reflecting on family connections. Through time, place, and circumstance, lifestyle choices can vary so much, yet still there is a link which is undeniable. 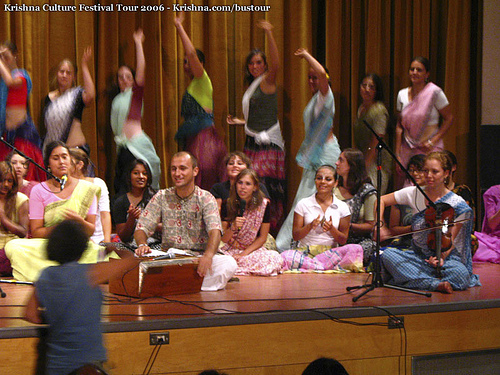 As a product of the first generation of ISKCON devotees, I am always fascinated by the stories which my parents and others have to tell; how their families reacted when they decided to devote themselves so wholly to something, which to many, was no more than a crazy cult. Some parents disowned their children; some tried to rescue them and some recognised and respected the core spiritual values that their children were dedicating their lives to, and found they could be at peace with them. My own parents families, Jewish and Christian respectively, initially found the idea of it all quite terrifying, but over the years, they have come to terms with it in their own way. My grandma came from a Methodist family – her father, a preacher for forty years proclaimed one day looking at my Dad ‘Look after this one, he’s going to be a priest when he grows up’. Maybe it was just his way of trying to kick start the calling to the cloth, but it makes me wonder what influence these early religious roots had on my Dad’s attraction for the Hare Krishna Movement. It made me think about my insignificant part in it all too. As the current bottom entry on the Harrison family tree, I wonder how the lives of all of these people have shaped who I am today. This morning my grandma was telling me about all the different members of her family, as she pointed them out in an old photo. I was somewhat surprised to learn just how many had been gifted musically. What interested me even further was how so many of the family used their musical talents in church. My great grandfather, the preacher, was apparently a very powerful singer and my grandma used to play the church organ by ear. My grandfather played the piano (also by ear) and all of their children (my dad included) sang in the choir. Other uncles and aunts sang and played instruments. Sometimes I feel that because my extended family are not on the same religious path as me, I have less to learn from them. However I think the older I get, the more I have begun to lose this judgemental attitude and have come to see so much that I can learn from the lives of my family. From my mother’s ancestors, who rebuilt their communities through hard work after emigrating from Eastern Europe; to my father’s ancestors who served in the Royal Air Force during the Second World War. But what struck home today was something smaller. I have been thinking a lot lately about how important it is, that I utilise whatever talents I have been given in Krishna’s service. I realised that when I play my violin or sing in kirtan at the temple, I am following in the footsteps of generations of my family. Hearing about how they loved to sing together, even at home made me think of my own family and how much we also love this. And it made me think of my worldwide family, and how we also love to sing together. It made me think of how ultimately, this holds us together. How wonderful it is that our greatest service is to sing and dance – spreading the name of Lord Krishna to every town and village. I reflected on all of this today in my dance and music classes, and prayed to Krishna to guide me to use these small talents in the best way that I can. And as the setting sun illuminated the sky this evening, after a day of torrential showers, I remembered one of my favourite verses from the Brahma Samhita that states ‘katha ganam natyam gamanam’, that in the transcendental abode of Lord Krishna, ‘every word is a song and every step, a dance’ – what more could we wish for? The ‘Obby ‘Oss (hobby horse) is thought to be representative of an ancient Celtic horse deity. Whilst the ‘Oss is prayed to for rather more mundane reasons, his fearsome face is reminiscent of Lord Nrsimhadeva, to whom we pray for ultimate spiritual benefit. This year, I became so much more aware not just to pray for my own protection, but for the protection of everyone in my life that I love; my family and my friends. For those that guide me and teach me and for those that inspire me. I pray for those at the very start of their spiritual journey, including myself – the path can be difficult and fraught with obstacles at first. I pray for the worldwide community of devotees, for those in much more trying situations than me and for those at the forefront of Srila Prabhupada’s army. I pray for the protection of ISKCON, the greatest treasure we posess. To chant Jaya Jaya Nrsimhadeva! So. It’s May. I have never been as awed by the changing of the seasons as I have this year. 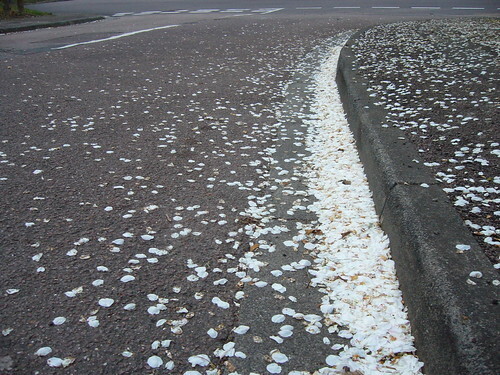 Every fortnight or so seems to bring a new wave of growth – flowers, bursting seedpods. These past weeks have brought the beautiful pink and red hawthorns, the azaleas, purple wisteria and lemon yellow laburnum. Every horse chestnut tree is covered in candelabras of white and pink blossoms. The bluebells are all dying now, although I was lucky enough to catch them at their peak at the Ashridge Estate. Sometimes I feel stupid for talking about the seasons and the weather so much. People often say it’s a very English obsession – probably true as it is so liable to change on this little green island. The diversity is incredible though. Whilst in Florida in December I was continually struck by the thought that England is about the size (or slightly smaller) than the state of Florida, yet I think it is so much more diverse, both in regional flora and fauna, in accents and word usage and in landscape. Must be something in the water.